I’m an admitted shopaholic. I love shopping for decorative items &amp; tableware. It’s a deep-rooted, dark cloud that hangs over me. But with every dark cloud there is a silver lining. For me, that silver lining is finding loads of things I need for my [tablescapes] at prices that don’t require gold bars to pay the tab. If you’re one of the lucky ones with a hefty bank account filled with mad money just waiting to jump into a retailer’s cash drawer, I salute you. Strike that…I wanna BE you!!! If you’re not, take this tip from me: HIT YOUR FAVORITE STORE(S) AT LEAST TWICE A MONTH. How else will you know what’s out there? You can get chummy with store personnel who will get to know your personal style and be able to make great suggestions for you. 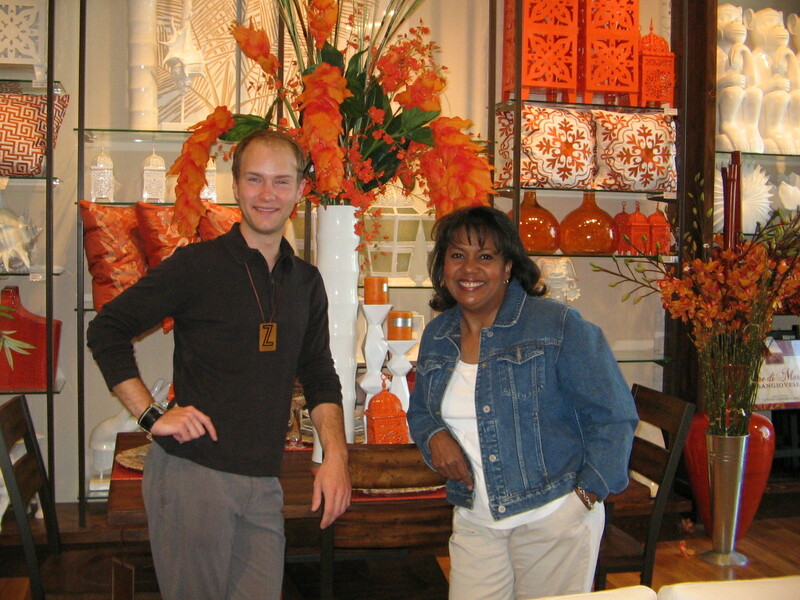 My favorite shopping genie is Thomas at Z Gallerie in Leawood, Kan. Thomas – who has enviably impeccable taste and is nothing short of a decorating wizard – has helped me on numerous occasions. In doing so, we have chatted and he knows a lot about what I like and what I can afford. He is able to point out what’s new and advise me on what’s hot. My favorite “Thomas quality” is that he never sniffs at me for visiting the clearance area. I am interested in 50% off, start breathing heavily at 60%, begin salivating at 75%, and at 90%…….”Clean up on Aisle 5! !” Great table bling and I get a terrific selection because I shopped early and/or often. They’re playin’ my song! Get yourselves in to the nearest Z Gallerie, available in 18 very lucky states! Oh, yes, I Looove Z Gallerie. I have been to the one in Santana Row in Santa Clara, California. The clearance is the best!